In this article, Nitin Chhoda defines the healthcare management process and how in past years it had been very complicated. He will share how electronic medical records can help make the physical therapy management and documentation process easier and simpler to understand. When patients think of healthcare management, they’re referring to their ailments, medications, tests and procedures. A physical therapist views healthcare management as a total package of client care, practice management, administration, insurers and reimbursements. Healthcare practice management is a rapidly changing landscape filled with new technology, coding upgrades, innovative treatments and a better understanding of existing conditions. Healthcare management in the 21st century means having the tools, knowledge and methods to provide the best possible care for clients. Therapists must invest in ongoing training, create liaisons with other healthcare providers, market their clinics successfully and educate the public. It’s an enormous responsibility and one that requires extensive time and effort. The scope of the tasks can seem overwhelming at times, but an EMR facilitates office processes, expedites revenues and enhances the quality of client care. Healthcare management in the practice setting encompasses working with multiple insurance companies and providers, interacting with patients in a variety of ways in and out of the office, and remaining in compliance with state and federal laws. It’s a lot to place on anyone’s plate, and smart therapists know that an EMR makes everyday tasks easier, increases productivity and creates a higher level of efficiency throughout the entire practice. The healthcare management process begins the moment a patient makes an appointment. There are health forms to complete, visits to schedule, and insurance information to verify. A client’s insurance eligibility and coverage is an essential part of the healthcare management process. It allows clinicians to provide the best treatments for the client within the boundaries and limitations of their insurance coverage, while ensuring the practice is compensated appropriately. In the electronic age, therapists need the tools to communicate with clients in a variety of ways. In days past, a mailing or a call to a landline will suffice. Today’s patients live busy, mobile lives and office technology must evolve to reflect those changes. 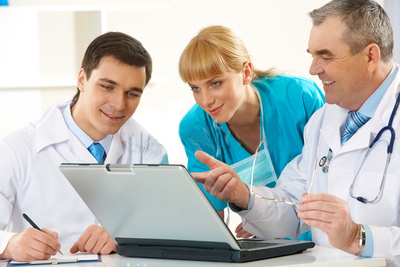 Superior healthcare management allows therapists to connect conveniently with clients by email, voice mail and text messaging with patient portals. Reminders can be sent about upcoming appointments, balances due, and test results can be posted online for patients to view. The digital age also allows practice owners to interact with pharmacies, labs, hospitals and other healthcare providers quickly and efficiently. Tests and prescriptions can be ordered using the power of the Internet and consultations with other healthcare professionals is just a click away with an EMR. The success of any practice rides on its available cash flow. A great deal of time will be devoted to obtaining and verifying insurance eligibility, ensuring correct coding, and follow ups to ensure funds reach the clinic’s account in a timely manner. Submitting that information electronically allows claims to reach insurers and clearinghouses almost instantly for a much faster turnaround on reimbursements. A steady cash flow allows clinicians to plan for the future in terms of equipment, training, staffing and expansions. Today’s patient may have numerous healthcare professionals overseeing their conditions and ailments. EMRs represent state-of-the-art technology to obtain a clear, concise and complete picture of a client’s medical history that’s updated instantly with an EMR. Therapists can manage their clients’ healthcare more efficiently, without spending valuable time simply waiting for paper records from another facility. Healthcare management encompasses a wide variety of tasks, from monitoring the efficacy of a patient’s care to ensuring reimbursements reach the clinic in the quickest way possible. Technology provides the means for better patient outcomes and enhanced cash flow. It’s also an environmentally sound solution that will save clinics thousands of dollars each year.